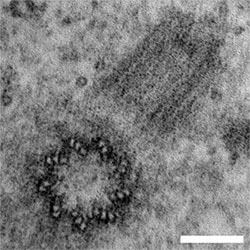 Figure 1: EM micrograph showing two centrioles in cross section (bottom left) and longitudinal section (top left). The triplet nature of the centriole wall and its nine-fold symmetry can be seen clearly. Scale bar: 100 nm. Centrioles are large and complex cell organelles that form the core of centrosomes and are essential for templating cilia and flagella. These structures are important for many cellular functions like cell division, fluid movement, motility, and sensing. Thus, it is not surprising that centriole dysfunction is associated with many human diseases such as microcephaly, ciliopathies and also cancer and infertility. In the past many centriole components have been identified by genetic, cell biological and biochemical methods, but how they come together to make functional centrioles is an unresolved question. The architecture of centrioles has so far been studied by low-resolution methods. 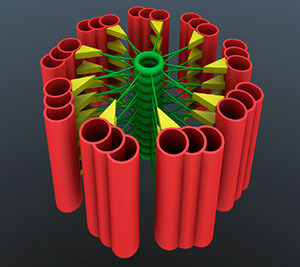 These showed centrioles to be 9-fold symmetric, barrel-shaped structures with the centriole wall built of microtubule triplets (Figure 1). My lab aims to elucidate how the centriolar components build-up centrioles and what precise role these components have in proper centriole functioning. Using a combination of cell biology, biochemistry and X-ray crystallography, we recently showed how a critical assembly intermediate of centrioles is organised and how this contributes to the establishment of the 9-fold symmetry of centrioles (Figure 1). Our goal is now to understand how the centriolar assembly is extended from this intermediate and what the other important centriolar components do in this process. Figure 2: Left: Simplified scheme of a cross section through a freshly formed centriole. The cartwheel structure (Cw.) in the middle of centrioles templates their assembly and determines their symmetry. Mt. : Microtubule. The cartwheel is degraded after centrioles are formed and is therefore not seen in the centriole shown in Figure 1. The localisation of the conserved centriolar protein SAS-6 is shown in green. Right: A close-up of the cartwheel hub that shows how it is organised structurally through the self-assembly of SAS-6 Right: A close-up of the cartwheel hub that shows how it is organised structurally through the self-assembly of SAS-6. Figure 3: Scheme of a freshly formed centriole as in Figure 2 but tilted (modified from Gopalakrishnan et al., Nat Commun. 2011; 2:359). The challenge ahead is to understand how this schematic organisation of centrioles is achieved on a structural level through the assembly of centriolar components and how this process is regulated. Cell Rep. 23(9): 2805-2818. doi: 10.1016/j.celrep.2018.04.100. Nat Commun. 9(1): 1731. doi: 10.1038/s41467-018-04122-x.